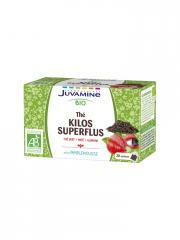 Juvamine Superfluous Kilos Tea 20 Sachets is the ideal tea to fight against the superfluous kilos. This tea contains Green Tea, Mate and Guarana, recognized to promote the natural degradation of fat. Green Tea and Mate associated together stimulate also the functions of elimination of the organism. Guarana has tonifying properties during the periods of diet. Its refreshing flavor of pomegranate ensures you a real moment of pleasure! 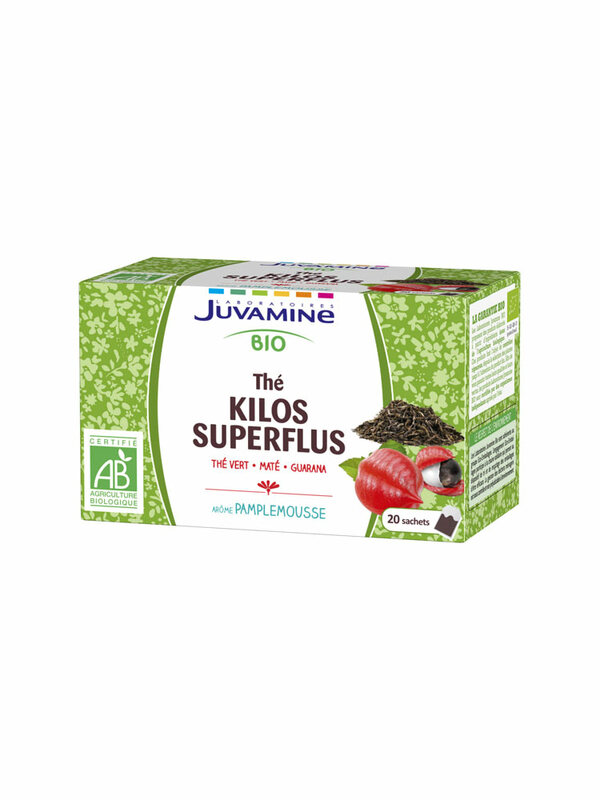 To restore the authentic taste of Superfluous Kilos Tea from Laboratoires Juvamine Bio, pour the boiling water on a sachet and let infuse during 4 minutes before drink. Maté* : 37%, Thé Vert de Chine* : 36%, Café Vert* : 9%, Guarana* : 9%, Arôme Naturel de Pamplemousse, Pamplemousse* (Fruit, Inuline*) : 1%.